South Korea, 1998 Colour – 98 min. The construction of an important road on the mountains renders the hotel business very attractive for a family that decides to run an inn. But the road construction is postponed and customers do not show up. When finally luck appears to be changing, for some reason the guests have difficulty surviving the night. Afraid of ruin, the family reaches the conclusion that it is better to keep some shovels around. 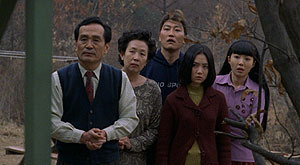 The Quiet Family won 1999's Fantasporto's FantAsia section at a time when Korean cinema was not yet much talked about in the West. Kim Ji-un's film has all the ingredients that please the fantastic film festival “traditional” audience: an intelligent and coherent text, a dark sense of humour and some bloodshed. 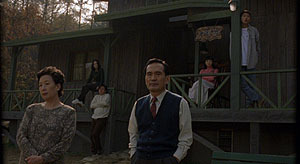 Without the dramatic intensity of his more recent film, A Tale of Two Sisters (2003), Joyonghan Gajok still shows some similarities with it: a house isolated in the countryside and the relationships amidst a somewhat dysfunctional family with similar taste in wallpaper. There are also two young sisters sharing a room, but their relationship and the family context are quite different. Other elements may suggest that A Tale of Two Sisters generated from some of the images and ideas present in The Quiet Family. Mi-na (Go) seems to feel a presence in the house, suggesting there might be something supernatural causing those events, a bit like what happens in the more recent film with Su-mi, Im Su-jeong's character. There is not much to do at an inn without customers: waiting by day, watching TV at night. Some of the shots are composed in a very similar way, establishing a connection between Mi-na and Su-mi, including a look at the house from a distance, a scene in which we may find strong symbolism. But their psychological factors are very different, Mi-na assuming a role of an observer, in opposition to Su-mi, who is the real center of the film. The construction of the relationships between characters is a reflection of the tone of each film. Here, we find a much more complex web for a lighter tone, in a narrative progressing through a succession of unlikely events: accidents, identity confusions, and bodies piling up. The humour is also built from the interaction between the several members of the family: the father (Park), the mother (Na), the uncle (Choi), the son Yeong-min (Kang) and the daughters Mi-su (Lee) and Mi-na. On the other hand, Janghwa, Hongryeon is more of a psychological thriller and drama requiring more screen time for less characters, which are therefore stronger and more clearly defined. Mi-na (Go Ho-gyeong, on the left), the younger daughter, senses something's lurking in and around the inn. In his first feature film, Kim Ji-un shows an outstanding control of the ingredients for a solid dark comedy, never allowing humour to become too silly or to undermine the unfolding of the story. The text works not because it is intricate but mainly due to the direction and the composition of the characters that sustain the absurd and unlikely situations in a way we do not rationalize and question them. Miike Takashi directed a remake with musical scores and stop-motion animation in 2001: The Happiness of the Katakuris. If all the remakes were like this one we would not scorn every time we heard a new one is scheduled for production. The same premise, but two different works altogether with completely different tone. And, most importantly, two good films. 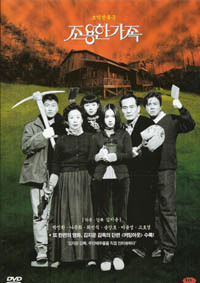 The South-Korean DVD (Myung Films) is coded R1 and R3. Anamorphic transfer, Dolby 5.1 and 2.0 sound tracks. It includes biographies, interviews, trailers, a “musical clip” (an editing of scenes from the film under a song from the OST), comparisons between the storyboard, and the short-feature film Coming Out (2001). Unfortunately there are no subtitles, not even for the short-feature film. Also available both in the UK and in the USA through Tai Seng (which does not usually means quality), with subtitled extras including the short-feature film.